Perfect Personalized Gifts for Every Child on your gift list can be found at For That Occasion. We're your one-stop shopping resource for all the Personalized Gifts you'll need for any child throughout the year for Birthdays, Holidays and Special Milestones and Celebrations. Our large selection of Kids Banks includes traditional colorful Piggy Banks designed in a variety of child centered themes. Look no further for a bank designed for a particular sports team or unique theme. Custom Piggy Banks are designed by our talented artist especially for you. Our Novelty Banks include Sport Ball Banks, Princess Castle Banks, Fire Truck & Train Coin Banks. There are Elephant Banks and the always popular Baby Announcement Banks. Every bank can be personalized for that extra special finishing touch. 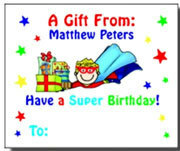 Personalized Kids Books & Personalized Music CDs are gifts that delight any young gift recipient. Kids love hearing stories with their name throughout the text or hearing their name repeated in familiar songs on a CD created especially for them. Our selection of Kids Books include Personalized Birthday Books and Personalized Christmas and Hanukkah Books in addition to whimsical, imaginative books all of which make your special boy or girl the star of the story. Our Personalized Music CD's include Disney and Sesame Street characters incorporating your child's name in their familiar sing-a-long songs. By including a child’s name in the finished product, a Personalized Book or Music CD is indeed a lasting and unique Personalized Gift. Our large section of Baby Gifts includes those special Personalized Baby Gifts for showers, to welcome the new arrival or First Birthday Gift. Browse Kids Name Wall Art & Custom Birth Posters for decorative keepsake additions to any nursery or child’s room and shop Puzzle Name Step-Stools and Personalized Clothes Racks for both colorful and useful Personalized Room Accessories for a nursery or child's bedroom. 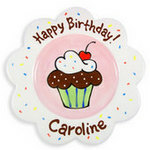 Personalized Birth Plates are keepsake gifts to welcome the new arrival and our Personalized Birthday Plates celebrate that most special day in a child’s life and become part of yearly birthday celebrations. Add a fun touch to any mealtime with a selection from Kids Personalized Placemats and Dinnerware. Kids delight in seeing their name on anything and will be thrilled to receive one of these whimsical and decorative Personalized Placemats or Melamine Dishes that can be used over and over again. There are even Personalized Christmas and Hanukkah Placemats and Dishes that add a festive touch to any table during the holiday season. 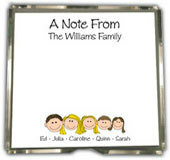 Moms and Dads love our Mom (and Dad) Pads and For The Teacher Notepads to jot off quick notes to teachers, babysitters and other parents while Personalized Gift Stickers and Lunch Stickers are handy helpers for busy parents. When you browse our extensive selection of Personalized Kids Gifts at For That Occasion, you will indeed find that special gift that will thrill your gift recipient. Friendly customer service representatives are available to help with answering questions, taking orders or even helping you choose the ideal gift for that special child in your life. If you need a gift in a hurry, just give us a call and a customer representative will be more than happy to take your order over the phone and put your order into production just as quickly as possible.. Whether shopping online or placing an order with a customer representative, shopping at For That Occasion is always an easy and no-hassle experience where you will indeed find unique, thoughtful and affordable gifts for any child on your gift list. Customer Satisfaction is our #1 Priority and is guaranteed at For That Occasion.